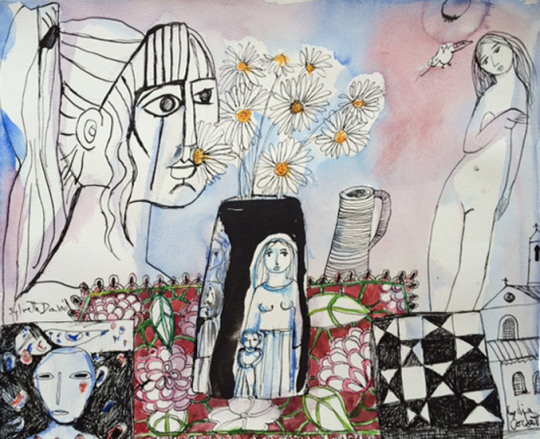 ‘A Luminous World – Picasso’s Muse’ 1st – 21st November 2015. Contact the gallery on 01451 831319 for more information. Only Picasso and Sylvette have known what they have experienced together within the compass of their shared imaginative order. 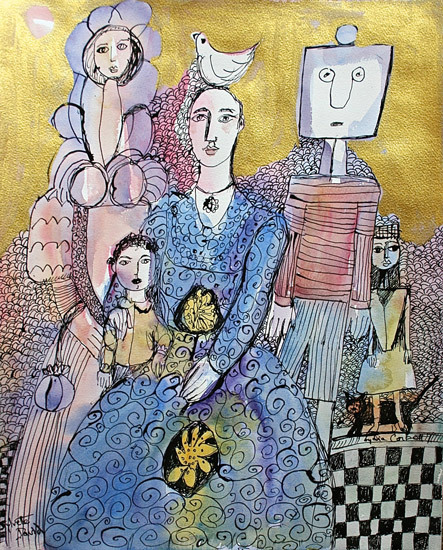 Her relationship with Picasso continues to this day – their paintings speak to each other. 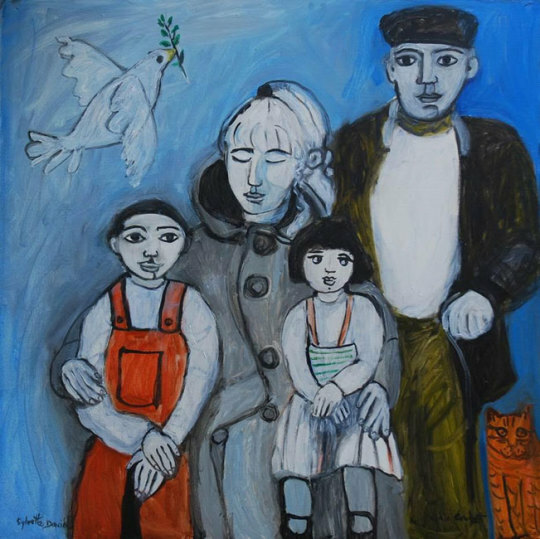 At various points in her painting life, Lydia Corbett has returned to her past and recuperated from its various presences – she has painted herself as Picasso painted her, she has also painted herself as Picasso saw her, and painted him as the young man she also knew he was. When someone dies they become both all their ages and ageless. One might expect that for a long while Lydia Corbett had a dual sense of resistance and anxiety that concerned the appropriation and assimilation of the abiding presence of Picasso in her work. One senses not so much that she is looking back but rather Picasso is very much a living presence in her life. It is understandable that she should remember him when he was young, 50 years before she was born. Picasso painted her when he was old with the love of a young man of around her age. Her gift of beauty and strength became his gifts to the world. There is an essential similarity between what he did for her in 1954 and what Lydia Corbett has continued to revisit and still connect with, that of his spirit and presence. If what is unconscious often becomes shown in Picasso’s work, what is conscious in hers moves to the unconscious. Picasso often too returned to his past, in the faces that sometimes pre-ordained in his drawings and portraits, faces that he said he had known all his life. The girl that he discovered when he was in his 70s would in turn, now that she is older than he was then, repay the compliment. But of course it is much more than that. If the works are painted without reference to any archetypal significance; it is beyond contestation that between Picasso and Sylvette, there still resides a perpetual baptism into the spirit. 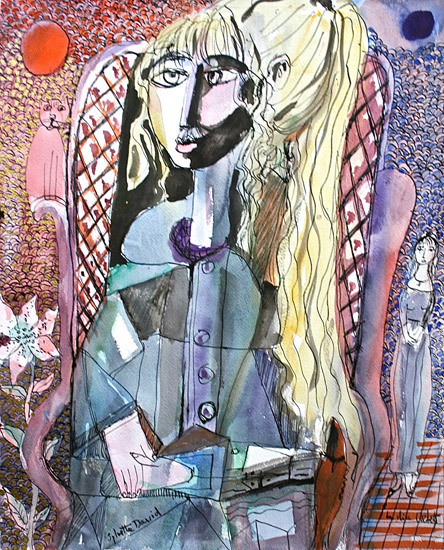 What Sylvette brings intensely back to the studio works that emanate from her life with Picasso in the spring and summer of 1954, is an abiding procreative presence of the eternal feminine which she embodied then as still to-day is so present and perpetuated in her work. In a spiritually balanced way it feels as though Sylvette has drawn back on some of the eternal elixir of youth that Picasso drank from; a source of life, with Picasso at her breast; an autumnal flowering of a springtime passion. Yeats wrote ‘the innocent and the beautiful have no enemy but time’. In Lydia Corbett’s case, even time has made an exception. The extraordinary major retrospective in Bremen in 2014, Sylvette, Sylvette Sylvette – Picasso and the Model has enabled a deepening understanding of her influence on Picasso as his muse and presence through the spring and Summer of 1954. Picasso developed a mode of expression singularly for her. The prevailing zeitgeist and deference to his next love, Jacqueline, meant that Sylvette’s significance in his life was not given the full attention and centrality it deserves. Picasso’s oeuvre attests to how much he was devoted to Sylvette, he created with the girl as his presiding spirit, with a passionate intensity that had not been in his works since the portraits of Marie Therese Walter. Picasso was the eternal adolescent, as Louis Aragon said of him, and Sylvette embodied youth for him, but at 19 when she met him she had a stoic wisdom that was more mature than his own. 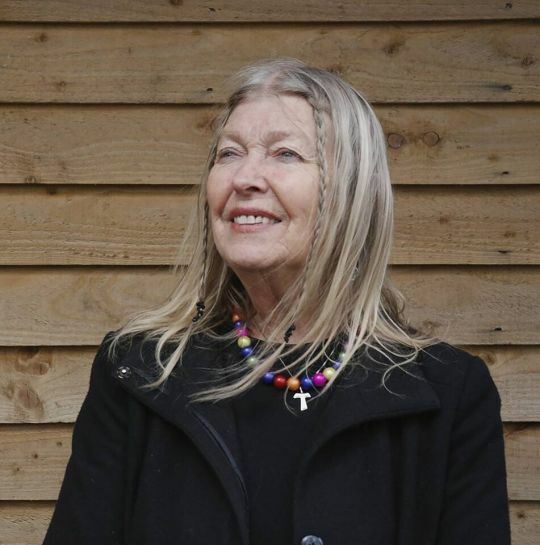 Meanwhile Lydia Corbett’s face in old age is still as unlikely as ever – a Scheherazade to immutable beauty. The irony is that when Sylvette was frightened of appearing naked in front of Picasso, but Picasso had already imagined her naked. He had proven this beyond doubt by showing her a painting he had made of her naked to the waist. Sylvette David grew up on the Isle du Levant, amidst the Les Iles d’Hyres, Naturist community, but she did not want to be seduced by Picasso. And so it came to pass that the 50 or so paintings he made of Sylvette are clothed, although he saw her naked in his mind. Each day she came she brought him something new. Picasso’s approach to his subject matter is never superficial. His paintings of Sylvette are a progressive obliteration of the distance between the said and the unsaid; the seen and the unseen. For almost six months they were silent companions and Picasso saw her depths. In a sense Picasso’s portraits are intimate proofs of the diminishing distance between Picasso and Sylvette. I sense that too, Corbett’s portraits and figure paintings of Picasso are an act of reconciliation, and when she returns to the studio in Vallauris in her mind, it is an opening and cleansing of the doors of perception. In the end Picasso looked into her face and peered into himself. Sylvette has always maintained that she was insistent to herself that she should keep her clothes on, whilst knowing all the while that Picasso wanted her to be naked. In a sense that tension created an intense bond, his unrequited desire is present in every portrait. Sylvette and Picasso still abide with each other, and he lives within her just as much now as she lived within him then. At the time when she was a girl of 19, their rendezvous in the studio were an unspoken tug of war of competing spirits. His wanting her was unspoken and he painted her once without a mouth. He spoke to her through his paintings and it carried on like that for days, for weeks for months. They were both two stubborn people, one defending her body and her choice, the other defending his desire and his art. Sylvette David at 19 years old – a hauntingly beautiful young woman with a willowy presence that seemed to embody a state of mind as much as a resurgence of youthful optimism all over Europe. Beyond her pale almost translucent skin, Sylvette was flesh and blood; she was bohemian and unconventional. Whilst reserved she was no stranger to love, and she refused to be either “a goddess or a doormat” in Picasso’s terms. She was not what Picasso was used to. Sylvette David was not a blank empty presence that he could project on to, that would have been without challenge. As Antoine de St-Exupéry wrote in Le Petit Prince of the other roses, “Vous êtes belle mais vous êtes vide. On ne peut pas mourir pour vous.” “You are beautiful but empty, One cannot die for you.” Brigit Bardot made herself look like Sylvette and visited him, but for Picasso she was just another rose who he would not paint. For Picasso, Sylvette was a major sensual discovery and an obsession; Sylvette would not be a wife, or just another one of his demoiselles or mistresses or prostitutes, courtesans or odalisques because she did not let him seduce her and so he could not have that moment afterwards where he ritualistically would pass through notions of being repulsed by her; as the usual fate of many of Picasso’s models who gave themselves entirely to him; the other woman became cathected by Picasso’s desires and held in his sexual gaze and deconstructed until all that remained of them was their tears. Her manifest beauty, for once, became a retaining wall. This is instantly and insistently attested to by his gentleness of spirit he had rarely accessed in front of a woman. It had been there at the beginning when Francoise Gilot stood naked in front of him, but perhaps Picasso had not known such beauty as Sylvette, in a desiring sense since he fell in love with Marie Therèse Walter, the girl he met by chance in the Galerie Lafayette, and who loved him back with a pure heart. Marie-Therèse’s voluptuous presence gave us The Dream and The Dreamer (both in 1932). The Bremen Catalogue Raisonné of the Sylvette series lists 73 works by Picasso, stretching from 1954 to 1970, and ends with the giant Sylvette projects for Rotterdam and New York. The last grand oeuvre of Picasso is a monumental Sylvette in white cement and pulverized granite betograve. Its enduring strength mirrors the qualities of Corbett’s art as seen in this current exhibition. Anthony Sheridan is a freelance writer, educated at the Universities, Sussex, East Anglia, Paris III and the Panthéon Sorbonne. He lived in Paris from 1994 to 2006 and is a contributor to Le Monde, The Guardian and the TLS. 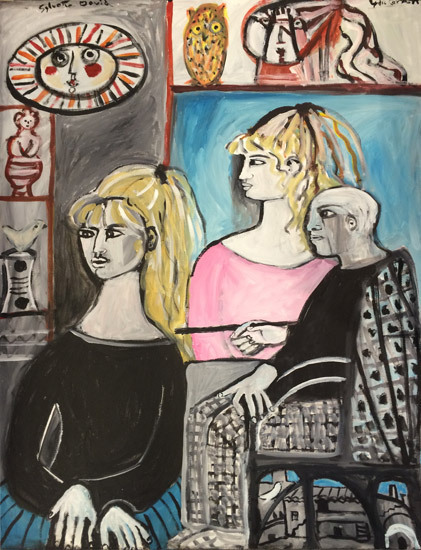 ‘A Luminous World – Picasso’s Muse’ opens 1st November 2015 at Fosse Gallery. Contact the gallery on 01451 831319 for more information.